How to Peel an Avocado- Fast! Ok, so Avocados are everywhere right? Avocado toast…avocado pudding….avocado smoothies…avocado hair masks…. it’s crazy! But I love avocados so I don’t mind one bit. Guacamole is one of my favorite things in the world and avocado toast is getting up there on my list of obsessions too. The avocado itself is a wonderful little bundle of nutritional awesomeness! It’s technically a fruit and full of over 20 vitamins and nutrients. It’s high in Vitamin K, Potassium(more than bananas!) Vitamin C, Folate, and it’s also high in monounsaturated fat. Monounsaturated fat are what people are talking about when they say “good” or “healthy” fats! They are proven to help reduce inflammation and there’s even positive correlation between then and cancer prevention! But one of my favorite things about avocados (and healthy fats in general) is that they’re nutrition boosters! They actually help us absorb the nutrients and vitamins that are in other foods. Many vitamins and nutrients in our foods are fat soluble which means that they need to be combined with fat in order for our bodies to utilize them and even absorb any of their goodness! These include (but there are many more) vitamins A, D, E and K… along with antioxidants like carotenoids. So for example if you have a delicious lettuce salad that is full of great vegetables but you top it with a fat free dressing or no dressing at all and just vinegar or lemon juice, many of those nutrients are just passing right through you and you aren’t getting any good stuff from them! Now lets say you add avocado to the salad or an olive oil vinegarette….TADA! You are now able to absorb those fat soluble nutrients and actually reap the benefits of the food you’re eating. Ok so we can all agree that avocados are delicious and nutritious but what is the best way to prep and peel the damn things? Not that there’s necessarily a “bad” way because as long as you’re getting it into your mouth, how can it be bad? But I have a tried and true way, that is outrageously easy, that many people have said they haven’t seen before so I figured I should share it with the world. Let’s walk through each step. And you should be left with two “pit free” halves of the avocado. Now starting at one end (the skinnier of the two usually works better) pull the skin away from the avocado flesh. I should peel off nicely in one piece but if it’s still a little “green” (not ripe) it might come off in pieces. Just peel until it’s all off. And you’ll be left with a delicious, clean, skin free, hunk of avocado that you can chunk, smash, slice, blend…or do whatever you want to do with! Happy Sunday! A few weekends ago I went a little spray paint crazy and was basically painted anything in my house that wasn’t tied down. It’s because I found the magic that is………. GOLD SPRAY PAINT. It’s for lack of a better term, liquid gold, literally. It started because I had a few things that I was test spray painting for my wedding and it was sooooooo amazing that I started painting other things too. Like lots of random things. Which I’m going to share with you bit by bit here on the blog but first as this was my first time using and crafting with pray paint, I thought I would go over a couple basics. First things first- which spray paint should I use? First of all I was primarily interested in GOLD spray paint. So I did some research on this and relied heavily on other bloggers testing out of spray paints brands to get the best “true gold” look. Here, Here, and Here are my trusty sources- see for yourself! 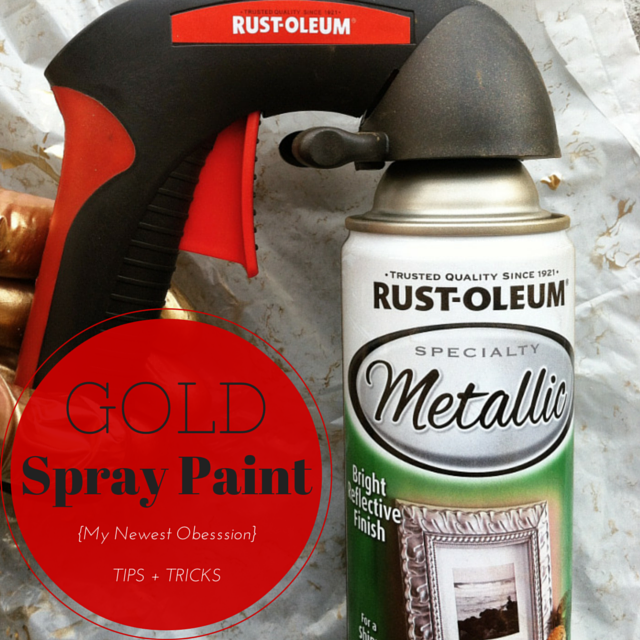 So I purchased the Rustoleum Metallic Gold paint as well as the little sprayer nozzle thing. It’s worked great (HIGHLY RECOMMEND) it just was easier to handle and I felt made things go on smoother. I was so desperate to paint I literally THREW this together. It worked great though! Yes that is snow on the ground and no it’s not recommended to spray paint in very cold temperatures but believe it or not this day got up to like 40 degrees and lets face it I might not see those temps for a few more months so I had to jump at the opportunity! Everything worked out just how I wanted. But I did learn a few things. 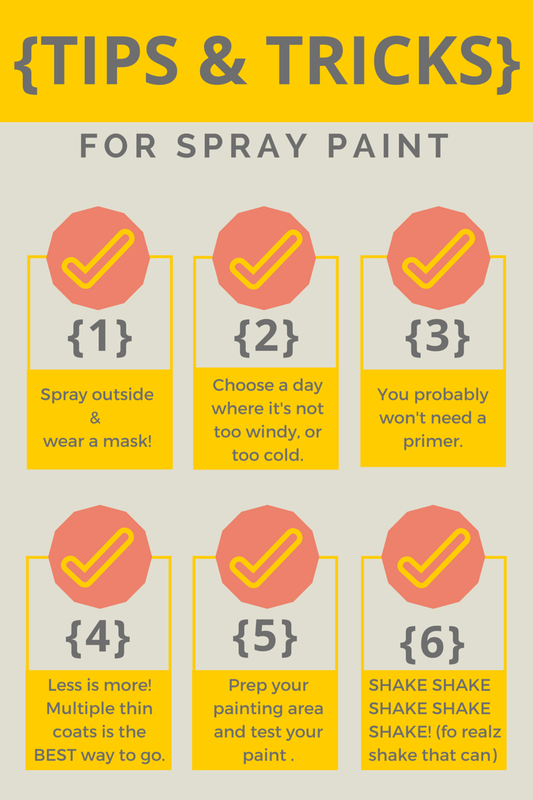 – With all the fumes that are just a part of spray paint, make sure you do it outside or in a HIGHLY ventilated area (like garage with the door open at a minimum) and also make sure to ware a mask or pant ventilator. For your own health, you don’t want to inhale that stufff. – You don’t need a primer, most likely. Unless you are doing a super high glossy item or furniture with lots of nooks and crannies. I didn’t use primer for any of my items and they turned out great. 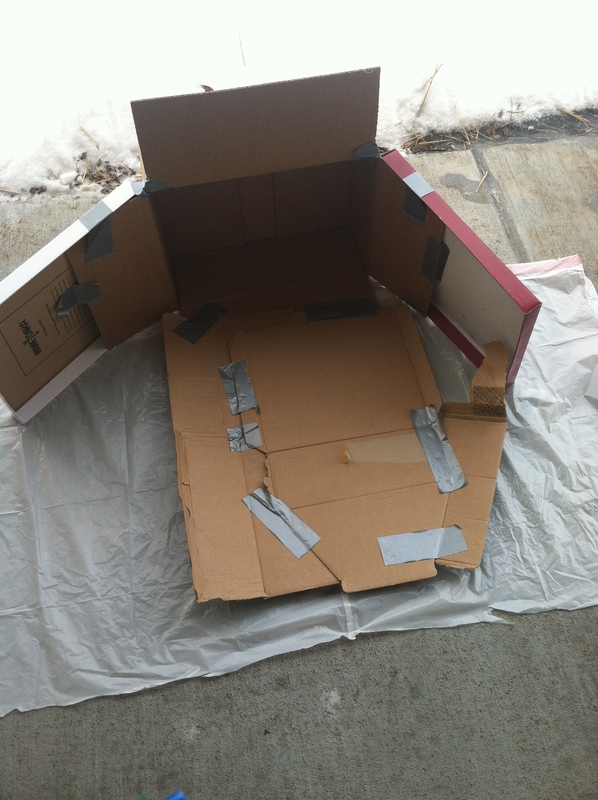 – A few thinner coats of paint are better than 1 or 2 THICK ones. Trust me. – Prep your area that you’ll be painting in (see pic above 🙂 ) and also make sure to test the paint before you start too. Just a test spray on your prep surface or piece of “junk” will do. You just want to make sure everything is working properly. Check back soon to see how we painted some vases, some string lights, and some napkin rings! Do YOU have any other tips or tricks to share? I’d love to hear them! It's snowy and cold and finally feeling like winter. ❄️ The older I get the more I appreciate every season. Maybe it's because life is moving at lightening speed (at yet some days so slow??). As a parent of young ones, some days are mind boggling mundane- fillled with routine, chaos, and arguing about the silliest things all rolled into one. Then you come across a picture of your little one that stops you dead in your tracks and makes you question how time can move so fast. I don't want to spend any more time wishing for "what's next". Spring will come and with it days my baby might not need me as much. So I'll cherish this season- snow, frigid temperatures, mundaneness, and all. We won't get this day again, let's make the most of all of it.